A few minutes later a guy walked in and, following the same procedure said, “I can’t believe it! This place would be a pig-pen if it weren’t for me! I’m the only person who ever does any clean-up,” and he cleaned up the small area. Still later another woman walked in and complained, “Nobody ever puts anything up but me,” and she proceeded to put things away. Question: Is that the way it is in your company, where “nobody does anything,” but everybody thinks they’re the only one who actually works? Thought: If that is true and you are the only one who does anything, think of the incredible advantage that gives you. Not only do you have job security, but the opportunity door is wide open for your move to the top. However, if you have a chip on your shoulder, if you honestly feel that you do everything and you share that feeling with others, your bad attitude negates your good work. So, stay busy, keep working, smile about it and your good attitude about “doing everything” will catch up with you. Think about it and I’ll see you at the top! 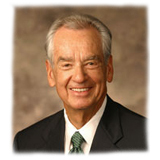 Zig Ziglar offers a weekly newsletter filled with more of his inspiring stories as well as practical ideas to help you in the areas of sales, marketing, customer service, and related topics. You can subscribe to the Zig Ziglar Newsletter at www.zigziglar.com.